Clinical studies have identified patients with nephrotic syndrome caused by mutations in genes involved in the biosynthesis of coenzyme Q10 (CoQ10), a lipid component of the mitochondrial electron transport chain and an important antioxidant. However, the cellular mechanisms through which these mutations induce podocyte injury remain obscure. Here, we exploited the striking similarities between Drosophila nephrocytes and human podocytes to develop a Drosophila model of these renal diseases, and performed a systematic in vivo analysis assessing the role of CoQ10 pathway genes in renal function. Nephrocyte-specific silencing of Coq2, Coq6, and Coq8, which are genes involved in the CoQ10 pathway that have been associated with genetic nephrotic syndrome in humans, induced dramatic adverse changes in these cells. 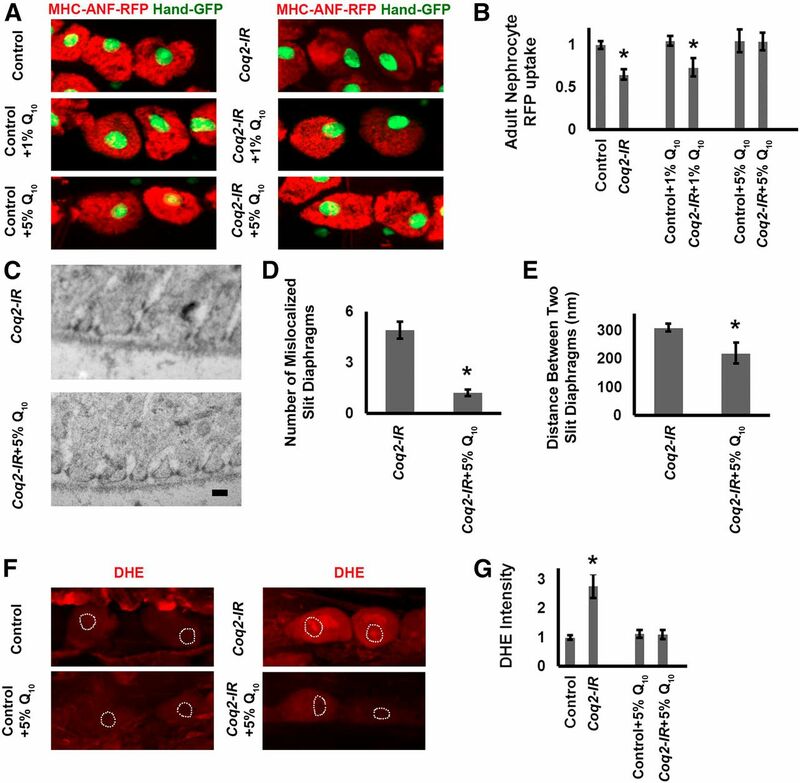 In particular, silencing of Coq2 led to an abnormal localization of slit diaphragms, collapse of lacunar channels, and more dysmorphic mitochondria. In addition, Coq2-deficient nephrocytes showed elevated levels of autophagy and mitophagy, increased levels of reactive oxygen species, and increased sensitivity to oxidative stress. Dietary supplementation with CoQ10 at least partially rescued these defects. Furthermore, expressing the wild-type human COQ2 gene specifically in nephrocytes rescued the defective protein uptake, but expressing the mutant allele derived from a patient with COQ2 nephropathy did not. We conclude that transgenic Drosophila lines carrying mutations in the CoQ10 pathway genes are clinically relevant models with which to explore the pathogenesis of podocyte injury and could serve as a new platform to test novel therapeutic approaches. Steroid-resistant nephrotic syndrome (SRNS) is a major cause of end stage renal disease (ESRD).1–5 The identification of single gene mutations associated with SRNS have yielded insights into pathogenic mechanisms, and evidence from multiple studies points to the podocyte as an important target of cellular injury.4,6–9 Increased understanding of molecular and cellular processes that are affected by mutations, and the development of new therapeutic treatment approaches, will be greatly aided by development of an animal model system that permits in vivo experimental studies relevant for elucidating podocyte cell function and cytotoxicity. Here, we utilized Drosophila as an in vivo model system to investigate the phenotypes associated with CoQ10 deficiency induced by the systematic silencing of all of the fly Coq genes specifically in nephrocytes. Our findings validate the clinical relevance of our experimental model system to study the pathogenesis of CoQ10-related human renal diseases. The CoQ10 synthesis pathway genes are highly conserved from Drosophila to humans. In humans, the genes include PDSS1 (COQ1 subunit 1), PDSS2 (COQ1 subunit 2), COQ2, COQ3, COQ4, COQ5, COQ6, COQ7, COQ8, and COQ9. Their functions are listed in Table 1. In Drosophila, the homologs of PDSS1 and COQ2 are named Qless and Coq2, respectively. Here, we have named the remaining Drosophila CoQ10 synthesis pathway genes Pdss2, Coq3, Coq4, Coq5, Coq6, Coq7, Coq8, and Coq9, corresponding to their human homologs (Table 1). The human genes that have been associated with the development of nephrotic syndrome (NS), focal glomerulosclerosis (FSGS), SRNS, and renal tubulopathy are indicated in Table 1. We generated Drosophila transgenic lines in which specific Coq gene expression was silenced in nephrocytes. This strategy used the UAS-Gal4 system21 in which flies carried a Dot-Gal4 driver construct whereby the Dot gene enhancer22 directed nephrocyte-specific expression5,13–15 of the yeast Gal4 transcription factor, which in turn promoted expression of a UAS-Coq-RNAi transgene that silenced the endogenous Coq target gene. The principal functions of the nephrocyte are first, to filter hemolymph, and second, to take up filtered low molecular weight proteins and toxins for recycling and sequestration, respectively.11,12 We took advantage of the second role to develop in vivo quantitative assays to measure the effects of gene silencing on nephrocyte uptake functions. We examined the ability of nephrocytes expressing Coq gene silencing RNAi transgenes to take up a fluorescent hemolymph marker protein. In this assay, flies carried a MHC-ANF-RFP transgene, in which a myosin heavy chain (MHC) promoter drove expression of an atrial natriuretic peptide-red fluorescent protein (ANF-RFP) fusion protein. Muscle cells secreted ANF-RFP into the fly hemolymph from which it was filtered and endocytosed by nephrocytes, and intracellular fluorescence was detected and quantitated.14 To confirm nephrocyte cell identity, flies also carried a green fluorescent protein (GFP) transgene expressed under the control of the Drosophila Hand gene promoter (Hand-GFP).23 MHC-ANF-RFP and Hand-GFP transgenes were combined in flies carrying Dot-Gal4 driver22 and UAS-Coq-RNAi constructs silencing the endogenous Coq target genes in nephrocytes. We systematically examined the effects on ANF-RFP fusion protein uptake of nephrocyte-specific silencing of Coq genes 1–9 and Pdss2. As shown in Figure 1A, control nephrocytes of adult flies not expressing a Coq-RNAi transgene contained readily detectable levels of ANF-RFP. We observed that silencing of Coq2, Coq6, and Coq8 (but no other Coq genes) led to significantly reduced levels of intracellular ANF-RFP marker protein relative to control nephrocytes (Figure 1B and Supplemental Figure S1). 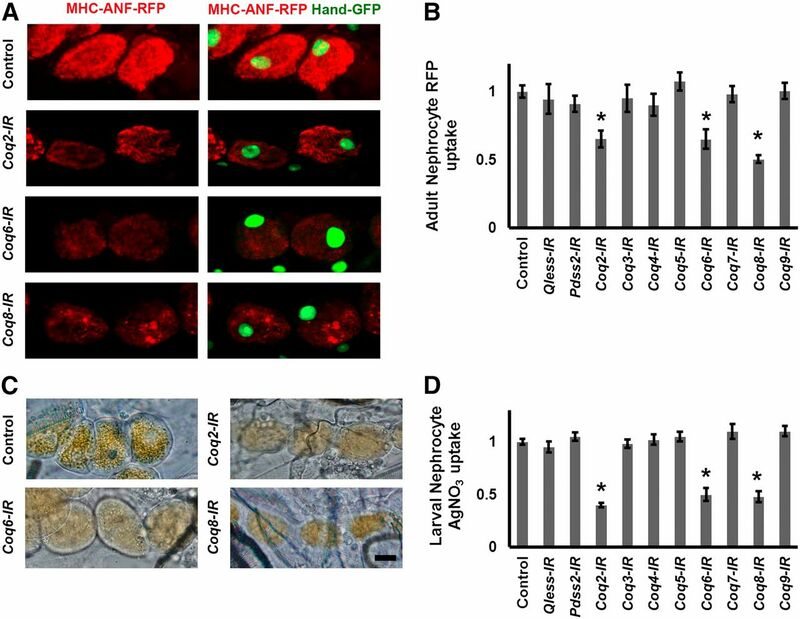 Hemolymph protein marker ANF-RFP and AgNO3 levels in nephrocytes expressing Coq-RNAi transgenes. (A) Fluorescence micrographs showing nephrocytes of adult flies 1-day postemergence. ANF-RFP fluorescence (red) is shown in the left panels. Right panels show RFP (red) merged with GFP (green, mostly nuclear). A GFP transgene is expressed under the control of a Hand gene enhancer (Hand-GFP) to confirm pericardial nephrocyte cell identity.23 All flies are transgenic for Hand-GFP. Control flies carry the Dot-Gal4 driver but no RNAi construct. Coq-IR flies carry Dot-Gal4 driving an RNAi transgene to silence expression of Coq2, Coq6, or Coq8 genes. (B) Quantification of nephrocyte RFP fluorescence, expressed relative to control value. For each genotype, 30 nephrocytes (six nephrocytes from each of five flies) were examined (*P<0.05). (C) Photomicrographs showing nephrocytes of third instar larvae reared on standard fly food supplemented with AgNO3. Control flies carry the Dot-Gal4 driver but no RNAi construct. Coq-IR flies carry Dot-Gal4 driving an RNAi transgene to silence expression of the indicated Coq gene. Scale bar, 20 microns. (D) Quantification of AgNO3, expressed relative to control value. For each genotype, 30 nephrocytes (six nephrocytes from each of five larvae) were examined (*P<0.05). A second in vivo nephrocyte functional assay was used to analyze the effects of Coq gene silencing. For these studies, toxic silver nitrate (AgNO3) was added to the standard diet of developing larvae. Ingested AgNO3 was taken up by normal nephrocytes and sequestered intracellularly (Figure 1C, Control), thereby protecting the animal from systemic exposure to the toxin.11 We observed that RNAi mediated silencing of Coq2, Coq6, and Coq8 gene expression led to decreased accumulation of AgNO3 in nephrocytes (Figure 1, C and D), a phenotype that was not observed upon silencing any other Coq genes. We used transmission electron microscopy (TEM) to determine if defects in uptake and accumulation of ANF-RFP and AgNO3 because of Coq2 gene silencing were associated with abnormalities in the characteristic nephrocyte slit diaphragm and lacunar channel ultrastructure.10 As shown in Figure 2, A and B, in normal (Control) nephrocytes the lacunar channels and slit diaphragms are regularly spaced along the circumference of the cell. A single slit diaphragm is located at the “mouth” of each channel. Silencing of Coq2 expression led to striking disruption of normal channel spacing and morphology and slit diaphragm localization (Figure 2C). Regular spacing was interrupted (Figure 2D), and some channels were dramatically narrowed and elongated. Mislocalized “ectopic” slit diaphragms were observed, frequently forming ladder-like arrays along a single channel (Figure 2, B and E). Quantitative analysis indicated that slit diaphragm mislocalization was not associated with an increased number of total slit diaphragms (Figure 2F). Coq2 gene silencing induced abnormal slit diaphragm localization and collapsed lacunar channels with multiple slit diaphragms (A) TEM showing normal (control) nephrocyte ultrastructure with slit diaphragms and lacunar channels uniformly spaced along the circumference of the cell. Slit diaphragms localized exclusively at the mouth of the channel. In Coq2-IR nephrocytes, channels appeared narrower (collapsed) and interchannel spacing was interrupted and irregular. Slit diaphragms occurred not only at the channel mouth but also ectopically along the interior channel membranes. Scale bar, 200 nm. (B) Higher magnification TEM comparing normal control and Coq2-IR slit diaphragm and lacunar channel ultrastructure. Ectopic slit diaphragms arranged in ladder-like configuration at points of channel narrowing are indicated by arrows. Scale bar, 100 nm. (C) Quantitation of normally localized slit diaphragms in control versus Coq2-IR nephrocytes. Average number of slit diaphragms positioned at mouths of lacunar channels per 2000 nm of cell circumference (*P<0.05). (D) The average distance (in nm) between normally localized slit diaphragms in control versus Coq2-IR nephrocytes (*P<0.05). (E) Quantitation of ectopic slit diaphragms in control versus Coq2-IR nephrocytes. Average number of slit diaphragms positioned along interior channel membranes per 2000 nm of cell circumference (*P<0.05). (F) Quantitation of slit diaphragms (normally localized plus ectopic) in control versus Coq2-IR nephrocytes. Total number of slit diaphragms per 2000 nm of cell circumference (*P<0.05). Because CoQ10 (ubiquinone) is a required component of the mitochondrial electron transport chain, we examined mitochondrial morphology by TEM analysis in nephrocytes expressing the Coq2 gene silencing transgene. Coq2 gene silencing led to increased numbers of mitochondria (Figure 3, A and B), essentially all of which displayed aberrant morphology, characterized by dramatic reduction of inner mitochondrial membranes and shortened cristae (Figure 3, A and C). Coq2 gene silencing induced elevated numbers of autophagosomes and abnormal mitochondria in nephrocytes. (A) Upper panels: TEM showing normal mitochondria (m) in control nephrocyte of a wild-type fly. In Coq2-IR nephrocytes the mitochondria are more abundant and morphologically abnormal. Autophagosomes (ap) are in evidence. Scale bar, 300 nm. Lower panels: higher magnification electron micrographs comparing normal control and Coq2-IR nephrocyte mitochondria. In nephrocytes in which Coq2 expression was silenced the mitochondria exhibited shortened cristae and fewer inner mitochondrial membranes. Scale bar, 200 nm. (B) Quantitation of mitochondria in control versus Coq2-IR nephrocytes. Average number of mitochondria per 4 μm2 area of cytoplasm (*P<0.05). (C) Percentage of mitochondria exhibiting abnormal morphology in control versus Coq2-IR nephrocytes (*P<0.05). (D) TEM showing mitochondria and autophagosomes in control nephrocyte of a wild-type fly. In Coq-IR nephrocytes, the number of autophagosomes was increased. Scale bar, 300 nm. (E) Quantitation of autophagosomes in control versus Coq2-IR nephrocytes. Average number of autophagosome per 4 μm2 area of cytoplasm (*P<0.05). Mitochondrial structural impairment plays a pathogenic role in various kidney diseases and therefore the removal of damaged mitochondria is fundamental for renal health.24 Our observation that Coq2 gene silencing in nephrocytes greatly increased numbers of dysmorphic mitochondria led us to speculate whether cellular responses aimed at removing damaged mitochondria might be upregulated. Autophagy, and more specifically mitophagy, is an important mechanism of mitochondrial quality control.24 TEM analysis revealed that nephrocyte autophagosome density was significantly increased as a result of Coq2 gene silencing (Figure 3, D and E). To further examine the extent to which autophagy and specifically mitophagy might be activated as a result of Coq2 gene silencing, we used a strategy involving nephrocyte expression of a transgenic marker-protein Atg8 that is doubly fluorescence-labeled with GFP and mCherry (GFP-Atg8-mCherry).25 This Atg8 marker is present in autophagosomes and accumulates in autolysosomes. In the acidic lysosome lumen the GFP fluorescence undergoes rapid quenching, whereas mCherry retains fluorescence activity. Thus, only a very minor subset of autolysosomes, if any, will exhibit GFP fluorescence. Because Atg8 accumulates to high levels in autolysosomes, mCherry fluorescence is relatively stronger in this compartment than in autophagosomes. As shown in Figure 4A, in control nephrocytes (upper three panels) expressing GFP-Atg8-mCherry neither GFP nor mCherry fluorescence was detectable in a punctate pattern indicative of Atg8 in either autophagosomes or autolysosomes. Silencing of Coq2 in nephrocytes (Figure 4A, lower three panels) was associated with low GFP and abundant mCherry fluorescence. Merged images confirmed the presence of few autophagosomes (yellow) and numerous autolysosomes (red). This result indicated that Coq2 gene silencing led to greatly increased autophagy. In order to investigate the effect of Coq2 gene silencing on mitophagy, we generated a Drosophila strain in which nephrocyte mitochondria are fluorescence-labeled with GFP and nephrocytes express an Atg8-RFP fusion protein.26 In nephrocytes of control flies, Atg8-RFP fluorescence was very low and no combined/overlapping mitochondrial GFP plus Atg8-RFP (yellow fluorescence) was detected (Figure 4, B, upper panels, and E). Coq2 gene silencing in nephrocytes was associated with a significant increase in GFP fluorescence (Figure 4, B and C) consistent with increased mitochondrial density observed by TEM (Figure 3). We again observed very significant upregulation of Atg8 (Figure 4, B, D, and E). 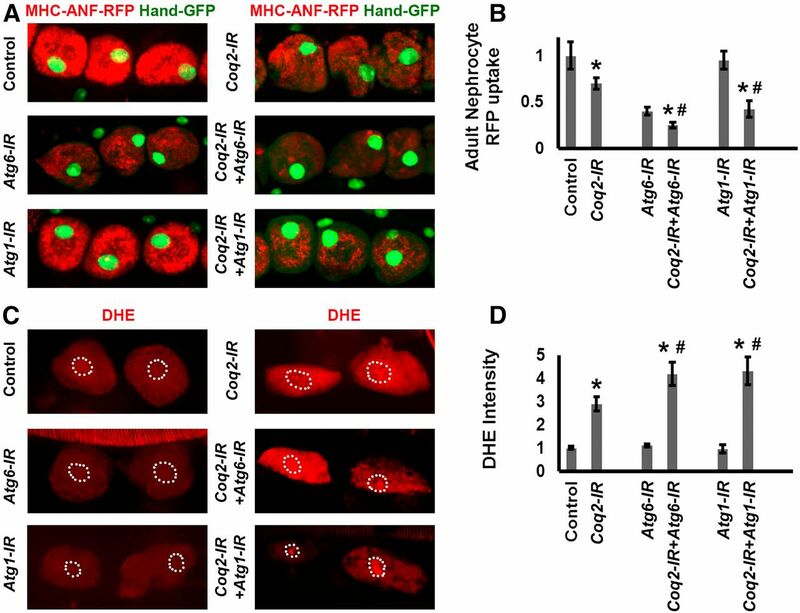 Merged images showed overlap of mitochondrial GFP plus Atg8-RFP induced by Coq2 gene silencing (Figure 4, B and E), indicating the presence of mitochondria in autophagosomes and thus revealing the occurrence of mitophagy. It was not clear from this analysis what percentage of nephrocyte mitochondria underwent degradation in autolysosomes. Coq2 gene silencing induced autophagy and mitophagy. (A) Fluorescence micrographs showing nephrocytes of adult female flies 1-day postemergence, expressing a dual-labeled GFP-Atg8-mCherry autophagy marker protein specifically in nephrocytes (UAS-GFP-Atg8-mCherry construct driven by Dot-Gal4). Dotted lines indicate nephrocyte cell boundary. Atg8 is present in autophagosomes and subsequently accumulates in autolysosomes. Fluorescence from the compartmentalized marker protein is punctate in appearance. Both GFP and mCherry fluorescence can be detected in autophagosomes. In the acidic lysosome lumen, GFP fluorescence undergoes rapid quenching whereas mCherry retains fluorescence activity. Therefore only very early autolysosomes will transiently exhibit GFP fluorescence. Because Atg8 accumulates to high levels in autolysosomes, mCherry fluorescence is relatively stronger in this compartment. Upper panels show control nephrocytes (normal Coq2 gene expression) in which autophagy is essentially undetectable. Lower panels show nephrocytes in which Coq2 gene expression was silenced (Coq2-IR) in which a few autophagosomes were present (GFP, green; GFP-Atg8-mCherry, yellow) and autolysosomes were highly abundant (mCherry, red). (B) Fluorescence micrographs showing nephrocytes of adult female flies 1-day postemergence, expressing GFP-labeled mitochondria and Atg8-RFP marker protein in nephrocytes. Dotted line indicates nephrocyte cell boundary. Upper panels show control nephrocytes (normal Coq2 gene expression) with labeled mitochondria (Mito-GFP, green), essentially undetectable autophagy (Atg8-RFP, red), and no overlapping yellow fluorescence in merged images (Mito-GFP Atg8-RFP). Lower panels show nephrocytes in which Coq2 was silenced (Coq2-IR) with increased mitochondrial fluorescence (higher Mito-GFP fluorescence, green), fluorescence because of Atg8 in autophagosomes/autolysosomes (Atg8-RFP, red), and overlap of fluorescence indicating mitophagy (Mito-GFP Atg8-RFP, yellow). (C) Quantitative comparison of Mito-GFP fluorescence in control versus Coq2-IR nephrocytes, expressed relative to control. The increased fluorescence due to Coq2 silencing is shown relative to control. For each group, 30 nephrocytes (six nephrocytes from each of five flies) were examined (*P<0.05). (D) Quantitative comparison of Atg8-RFP fluorescence in control versus Coq2-IR nephrocytes, expressed relative to Control. For each group, 30 nephrocytes (six nephrocytes from each of five flies) were examined (*P<0.05). (E) Quantitative spatial comparison of Mito-GFP (green), Atg8-RFP (red), and Mito-GFP Atg8-RFP (yellow) fluorescence in control versus Coq2-IR nephrocytes. In order to ascertain whether Coq deficiency and autophagy pathways intersect in nephrocytes, we analyzed the effects of combined silencing of Coq2 and either of the autophagy genes Atg-127 or Atg-6.28 As shown in Figure 5, A and B, the silencing of Atg-6 alone markedly reduced RFP levels but Atg-1 silencing had no effect. Simultaneously silencing Coq2 and either Atg-1 or Atg-6 led to a more severe RFP phenotype than either Coq2 or Atg gene alone, suggesting that Coq deficiency and autophagy pathways are linked. Simultaneous silencing of Coq2 and autophagy genes induces synergistic effects. (A) Fluorescence micrographs showing nephrocytes of 1-day postemergence adult flies transgenic for Hand-GFP (GFP expressed under the control of a Hand gene enhancer to confirm pericardial nephrocyte cell identity).23 ANF-RFP (red) is merged with GFP (green, predominantly in nucleus). Control flies carry the Dot-Gal4 driver but no RNAi construct. Gene-IR flies carry Dot-Gal4 driving RNAi transgenes silencing endogenous Coq2, Atg1, or Atg6 genes singly or in combination. (B) Quantitation of nephrocyte RFP levels, relative to control. For each genotype, 30 nephrocytes (six nephrocytes from each of five flies) were examined (* indicates significance compared with control, # indicates significance compared with Coq2-IR; P<0.05). (C) Oxidized DHE fluorescence (red) in nephrocytes of third instar larvae. Dashed lines indicate cell nuclei (determined from DAPI staining, not shown). (D) Quantitation of DHE fluorescence intensity expressed relative to control nephrocytes. For each genotype, 30 nephrocytes (six nephrocytes from each of five larvae) were examined (* indicates significance compared with control, # indicates significance compared with Coq2-IR; P<0.05). ROS production and oxidative stress have been implicated in renal disease associated with CoQ10 deficiency.18 Consequently, we examined the effect of Coq2 gene silencing on ROS levels in nephrocytes. Dihydroethidium (DHE) was used as a redox indicator.29,30 Reduced DHE fluoresces blue, but undergoes a shift to red fluorescence when oxidized, and intercalates into DNA. Coq2 silencing alone induced an approximately three-fold increase in DHE red fluorescence intensity (Figure 5, C and D). Silencing either Atg1 or Atg6 alone had no effect. Simultaneous silencing of Coq2 and either Atg6 or Atg1 led to significantly higher DHE fluorescence than Coq2 alone (Figure 5, C and D), again suggesting linkage of Coq and autophagy pathways. We tested whether supplementing the fly diet with CoQ1031 could rescue deficient ANF-RFP uptake and abnormal slit diaphragm and lacunar channel morphology associated with Coq2 gene silencing (Figure 6). We observed no increase in ANF-RFP uptake when wild-type control flies were fed a diet supplemented with 1% or 5% CoQ10. By contrast, nephrocytes expressing Coq2-RNAi (Coq2-IR) showed normal levels of ANF-RFP uptake when flies were reared on a diet containing 5% CoQ10 (Figure 6, A and B). We furthermore observed that 5% CoQ10 diet supplementation largely restored normal slit diaphragm and lacunar channel morphology in nephrocytes expressing the Coq2-IR transgene (Figure 6, C, D, and E). We further observed that ROS levels could be lowered in Coq2-IR nephrocytes by administration of 5% CoQ10 (Figure 6, F and G). CoQ10 administration rescued nephrocyte functional and ultrastructural defects induced by Coq2 gene silencing. (A) Fluorescence micrographs showing nephrocytes of 1-day postemergence adult flies. Flies were reared from embryos on standard food supplemented with the indicated concentrations (1% or 5%) of CoQ10 (Q10). Left panels (MHC-ANF-RFP) show intracellular ANF-RFP fluorescence (red). Right panels (MHC-ANF-RFP Hand-GFP) show RFP (red) merged with GFP (green, mostly nuclear). A GFP transgene is expressed under the control of a Hand gene enhancer (Hand-GFP) to confirm pericardial nephrocyte cell identity.23 All flies are transgenic for Hand-GFP. Control flies carry the Dot-Gal4 driver but no RNAi construct. Coq2 flies carry Dot-Gal4 driving RNAi transgene silencing Coq2 expression. (B) Quantitation of RFP levels in control versus Coq2-IR nephrocytes (expressed relative to control) with no Q10, 1% Q10, or 5% Q10 dietary supplementation. For each genotype, 30 nephrocytes (six nephrocytes from each of five flies) were examined (*P<0.05). (C) TEM showing mislocalized slit diaphragms and irregularly spaced and collapsed lacunar channel ultrastructure induced by Coq2 silencing (upper panel) rescued by administration of 5% Q10 (lower panel). Scale bar, 300 nm. (D) Quantitation of ectopic slit diaphragms in Coq2-IR versus Coq2-IR plus 5% Q10 supplementation nephrocytes. Average number of slit diaphragms positioned along interior channel membranes per 2000 nm length of cell circumference (*P<0.05). (E) The average distance (in nm) between normally localized slit diaphragms in Coq2-IR versus Coq2-IR plus 5% Q10 supplementation nephrocytes (*P<0.05). (F) ROS levels in normal (control) and Coq2-silenced (Coq2) nephrocytes were indicated by oxidized DHE red fluorescence in the cell nucleus. ROS levels were higher in Coq2-IR nephrocytes, and feeding Coq2-IR larvae a diet supplemented with 5% Q10 reduced nephrocyte ROS levels. Dashed lines indicate cell nuclei (determined from DAPI staining, not shown). (G) Levels of DHE red nuclear fluorescence expressed relative to normal control larval nephrocytes fed a nonsupplemented diet. Coq2 gene silencing led to a 2.5–3-fold increase in ROS levels. Feeding Coq2-IR 5% Q10 lowered ROS to normal levels. In each case, 30 nephrocytes (six nephrocytes from each of five larvae) were examined (*P<0.05). We tested whether the human COQ2 gene could complement Drosophila Coq2 gene knockdown and rescue nephrocyte function in vivo. We cloned a wild-type COQ2 cDNA and generated a UAS-COQ2 transgenic fly line. When combined in a Dot-Gal4;UAS-Coq2-RNAi;UAS-COQ2 genetic background, nephrocytes accumulated ANF-RFP at significantly higher levels than observed in Dot-Gal4;UAS-Coq2-RNAi flies, demonstrating rescue by COQ2 (Figure 7). To further demonstrate the clinical relevance of the Drosophila model as a platform for studies of COQ gene mutations underlying kidney disease, we generated a fly line combining Dot-Gal4;UAS-Coq2-RNAi with a patient-derived COQ2-S146N mutant allele.6 As shown in Figure 7, the COQ2-S146N allele failed to rescue the endogenous Coq2 silencing–induced defect in ANF-RFP accumulation. A normal allele of the human COQ2 gene but not a mutant allele (COQ2-S146A) rescued nephrocyte function in flies expressing Drosophila Coq2-IR. (A) Fluorescence micrographs showing uptake of ANF-RFP nephrocytes of 1-day postemergence adult flies. Left panels (MHC-ANF-RFP) show intracellular ANF-RFP fluorescence (red). Right panels (MHC-ANF-RFP Hand-GFP) show RFP (red) merged with GFP (green, mostly nuclear). Hand-GFP expression confirms pericardial nephrocyte cell identity. All flies are transgenic for Hand-GFP. Control flies carry the Dot-Gal4 driver but no RNAi construct. Coq2-IR flies carry Dot-Gal4 driving RNAi transgene silencing the endogenous Drosophila Coq2 gene expression, and where indicated, also a UAS-COQ2 (wild-type human COQ2 allele) or a UAS-COQ2-S146N (mutant human COQ2 allele).6 (B) Quantitation of RFP levels (expressed relative to control) in control versus Coq2-IR nephrocytes expressing normal COQ2 or mutant COQ2-S146N. For each genotype, 30 nephrocytes (six nephrocytes from each of five flies) were examined (*P<0.05). Here, we found that a Drosophila model of COQ2 nephropathy is a powerful in vivo system to study the molecular mechanisms underlying pathogenesis of this renal disease, as well as the roles of other CoQ10-related gene mutations in causing human nephropathies. More specifically, we found that silencing the expression of Coq2, Coq6, or Coq8 genes in nephrocytes led to significant deficits in protein uptake and toxin sequestration, two critical nephrocyte functions. In addition, the Coq2 knockdown strikingly altered the localization of slit diaphragms in nephrocytes, as well as the morphology of the lacunar channels, thus disrupting critical structures needed for hemolymph filtration and endocytosis.10 Furthermore, we showed that the phenotypes associated with Drosophila Coq2 gene silencing could be rescued either by dietary CoQ10 supplementation, or by the expression of the wild-type human COQ2 gene, but not by expressing a mutant COQ2 allele derived from a COQ2 nephropathy patient.6 Our findings thus demonstrate that a patient-derived mutation contributing to the development of a specific glomerular disease can be introduced into our Drosophila model, in effect creating a personalized approach to investigate the pathogenesis and even treatment of specific renal diseases in vivo. Only two genes involved in the fly CoQ10 synthesis pathway have thus far been named (Qless and Coq2). In this study, we named the remaining fly genes after their corresponding human homologs (Table 1). Functional deficits in nephrocyte protein uptake and AgNO3 sequestration were observed in young adult flies and larvae, respectively, after silencing of Coq2, Coq6, and Coq8 genes but not other genes involved in CoQ10 biosynthesis. This observation suggests that Coq2, Coq6, and Coq8 may play critical roles in the CoQ10 pathway. Interestingly, mutations in the human COQ2, COQ6, and COQ8 genes have been linked to the development of SRNS (Table 1). These findings may reflect similar genetic vulnerabilities of human podocytes and fly nephrocytes. CoQ10 is essential for mitochondrial electron transport. Studying nephrocytes in which Coq2 gene expression was silenced could shed light on how defective electron transport in CoQ10-deficient patients leads to abnormal podocyte structure and function. A remarkable finding from this study was that Coq2 gene silencing induced the abnormal localization of nephrocyte slit diaphragms associated with the collapse of lacunar channels. Although additional studies will be required to elucidate how Coq2 silencing causes these changes, disruption of these key nephrocyte structures is compatible with the functional deficits observed in our in vivo assays. Because such structural changes were not seen in the context of other genetic manipulations that severely reduced nephrocyte function, we speculate that lack of filtration and/or uptake per se cannot be the cause of slit diaphragm mislocalization and lacunar channel collapse. It is possible that increased levels of ROS produced by disruption of normal mitochondrial electron transfer reactions may injure the plasma membrane, precipitating the rearrangement of slit diaphragms and the collapse of lacunar channels. Whatever the mechanism, it is intriguing to observe that slit diaphragms can occur at ectopic sites that are not proximal to the basement membrane. Whether the ectopic slit diaphragms are structurally normal and functional remains to be determined. We observed increased ROS levels in Coq2-silenced nephrocytes. We propose that nephrocytes, normally subject to elevated ROS levels,32 are particularly susceptible to further increases in ROS and that CoQ10 deficiency resulting from Coq2 gene silencing pushes ROS levels above a threshold of oxidative stress that results in cellular injury and loss of function. A major target is the mitochondrial inner membrane. In addition, membrane lipids associated with the slit diaphragm are rendered susceptible to oxidative damage, affecting the dynamic actin cytoskeletal components that maintain the structural integrity of the slit diaphragm and lacunar channel network that surrounds the cell, and are necessary for the essential nephrocyte functions of filtration and endocytosis of proteins and toxins. By extension to mammalian podocytes, this hypothesis provides an explanation for the susceptibility of the kidney to injury as a result of mutations in COQ genes. Another important observation from the Drosophila model of human COQ2 nephropathy was increased numbers of dysmorphic mitochondria in Coq2-silenced nephrocytes. Similar findings have been reported for podocytes of patients with COQ2 nephropathy,6 and in a mouse kd/kd (PDSS2) disease model.7,33 Taken together, these observations further validate the relevance of studying Drosophila nephrocytes to better understand how CoQ10 deficiencies can affect mitochondria in podocytes. It is tempting to speculate that podocytes and nephrocytes normally require relatively high levels of ATP and that critical functions of these cells are particularly sensitive to altered bioenergetics resulting from disrupted mitochondrial electron transfer pathways. We also observed that nephrocyte Coq2 silencing was associated with increased autophagy and mitophagy. The latter is an important mitochondrial quality control mechanism, and given the striking increase in abnormal mitochondria after Coq2 gene silencing, it was not surprising to observe upregulated mitophagy. However, 50% of mitochondria remained unassociated with autophagosomes or autolysosomes (Figure 4E), and virtually all mitochondria exhibited abnormal structures (Figure 3C). In this model, it appears that reduced CoQ10 levels resulted in damaged mitochondria (and thus compromised cell bioenergetics), triggering compensatory accumulation of abnormal mitochondria and upregulated mitophagy. Under these conditions, quality control through mitophagy was inadequate to counter the deleterious consequences of mitochondrial dysfunction, including increased ROS (Figure 5). We speculate that much of the autophagy observed in nephrocytes with silenced Coq2 expression was induced in response to abnormal oxidative damage of cellular components, and the results of our genetic interaction experiments suggest that Coq and autophagy pathways are linked. In conclusion, we have generated a new Drosophila model of human COQ2 nephropathy and established its clinical relevance for investigating the pathogenesis of this renal disease in humans. In addition, we demonstrate that Drosophila nephrocytes can be used to study pathogenic roles of other genes involved in the CoQ10 biosynthesis pathway, and as an in vivo drug-testing platform to evaluate therapeutic approaches for treating cellular injury and structural and functional abnormalities relevant to kidney disease. Flies were reared on standard food at room temperature or 29°C for UAS-Gal4 experiments. The following strains were used in this study: Hand-GFP,23 Dot-Gal4,14 MHC-ANF-RFP,14 UAS-Qless-IR, UAS-Coq2-IR, UAS-Coq3-IR, UAS-Coq4-IR, UAS-Coq5-IR, UAS-Coq6-IR, UAS-Coq7-IR, UAS-Coq8-IR, UAS-Coq9-IR, UAS-PDSS2-IR, UAS-Mito-GFP, UAS-GFP-Atg8-mCherry, UAS-Atg1-IR, UAS-ATG6-IR, UAS-Atg8-RFP (the last kindly provided by Ernst Hafen). Sources and ID numbers of silencing strains used in this study are provided in Supplemental Table S1. The wild-type COQ2 cDNA was obtained from OriGene, and encodes the common 371-aa isoform (GenBank ID: AAH08804). The mutant human COQ2-S146N cDNA6 was generated using QuikChange Site-Directed mutagenesis kit (Agilent Technologies). To generate UAS-COQ2 and UAS-COQ2-S146N transgenic fly lines, the above cDNAs were cloned into the pUAST vector and introduced into the germ cells of flies by standard P element–mediated germline transformation. Flies from the MHC-ANF-RFP, Hand-GFP, and Dot-Gal4 transgenic lines were crossed to flies from the UAS-Coq-RNAi transgenic lines at 25°C.14 One day after egg-laying, embryos were shifted to 29°C. RFP uptake by pericardial nephrocytes was assessed in adult flies 1 day postemergence by dissecting heart tissues into Drosophila Schneider Medium (Gibco) and examining cells by fluorescence microscopy. For quantification, ≥20 nephrocytes were analyzed from each of three female flies per genotype. The results are presented as mean±SD. Statistical significance was defined as P<0.05. Flies of the appropriate genotype were allowed to lay eggs on standard apple juice agar plates for 24 hours. Freshly emerged first instar larvae were transferred to agar-only plates supplemented with regular yeast paste containing AgNO3 (2.0 g yeast in 3.5 ml 0.0005% AgNO3 solution) and allowed to develop at 29°C until adulthood.14 AgNO3 uptake by pericardial nephrocytes was assessed in adult flies 1-day postemergence by dissecting heart tissues into Drosophila Schneider Medium (Gibco) and examining cells by phase-contrast microscopy. For quantification, ≥20 nephrocytes were analyzed from each of three female flies per genotype. The results are presented as mean±SD. Statistical significance was defined as P<0.05. Larvae and adult flies were dissected and fixed for 10 minutes in 4% paraformaldehyde in PBS. Confocal imaging was performed with a Zeiss ApoTome.2 microscope using a 20× Plan-Apochromat 0.8 NA with air objective. For quantitative comparisons of intensities, common settings were chosen to avoid oversaturation. ImageJ Software Version 1.49 was used for image processing. Threshold was adjusted for each picture to remove background on both red and green channels. Red mean intensity in each nephrocyte was normalized to the green intensity of the same cell. TEM was carried out using standard procedures. Briefly, flies of the indicated genotypes were fixed with Sorensen phosphate buffer containing 4% paraformaldehyde and 2.5% glutaraldehyde. The processed samples were analyzed using a Philips CM100 TEM. Flies of the appropriate genotypes were crossed at 25°C. One day after egg-laying, embryos were shifted to 29°C. Fluorescence markers were assessed in adult female flies 1-day postemergence by dissecting heart tissues into Drosophila Schneider Medium (Gibco) and examining cells by fluorescence microscopy. For quantitative comparisons, 30 nephrocytes (six nephrocytes from each of five flies) were examined from each group. Statistical significance was defined as P<0.05. Flies of the appropriate genotype were reared from embryos on standard fly food supplemented with 1% (wt:vol) or 5% (wt:vol) ubiquinone/CoQ10 (USP grade, formulated as Qunol; Quten Research Institute, LLC, Fairfield, NJ) at 29°C. Nephrocytes dissected from third instar larvae were maintained in Schneider Medium (Gibco) containing 10 μM DHE (Invitrogen) for 30 minutes at room temperature. Nephrocytes were fixed and imaged by fluorescence microscopy. We thank the Bloomington Drosophila Stock Center, the Vienna Drosophila Resource Center, and Ernst Hafen for fly stocks. Z.H. was supported by National Institutes of Health (NIH) R01 grant DK098410. P.E.R. was supported by NIH R01 grants DK49419, DK103564, and DK108368. J.-y.Z. and Y.F. contributed equally to this work. This article contains supplemental material online at http://jasn.asnjournals.org/lookup/suppl/doi:10.1681/ASN.2016060626/-/DCSupplemental. : Mitophagy: Basic mechanism and potential role in kidney diseases. Kidney diseases, 1: 71–79, 2015.